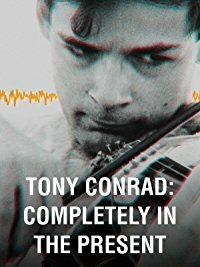 As a rule, I do not like movies like Tyler Hubby’s Tony Conrad: Completely in the Present; however, for many reasons, I very much did like Tyler Hubby’s Tony Conrad: Completely in the Present. Documentaries about the lives and careers of artists can easily lapse into cinematic low-hanging-fruit. They are the thinking person’s “What’d you think of the new Star Wars?” Luckily, Hubby has crafted a documentary about the artist/musician/filmmaker/teacher/etc. Tony Conrad that captures something that is a bit more than the sum of its parts. Like Conrad’s work, the documentary fills the viewer (or at least it filled this viewer) with a sense of wonder at the possibilities inherent to its medium. Whether this should be attributed to Hubby or to his subject matter is a fair question, but the end result is the same. Tony Conrad was an influential but often overlooked part of the American avant garde in the second half of the 20th Century. He participated in the formation of minimalist music, the Velvet Underground, and underground/experimental cinema. Hubby’s documentary takes a basic chronological approach to Conrad’s career that spanned half a century. The movie was made before Conrad’s death in 2016, so the extensive interview footage is a valuable addition to a body of work that was already illuminating. In the early 80s, Conrad built a large prison set in his art studio and began shooting a film that was to be titled Women in Jail. He cast many of his male friends to play the titular “women” but the film was never finished. Thirty years later, he began working on the same film with the same cast on the same set, but the suicide of one of his leads stopped this sprawling, ambitious film from ever being completed. This is cinema at its most conceptual. I won’t even bother trying to top Conrad’s own explanation of one of his “Yellow Movies.” If you can follow along and appreciate what he’s getting at with these pieces, you’ll likely love his entire body of work! Spending time with Tony Conrad is to become infected with an urge to create, explore, and experiment. This is the sort of movie that will hopefully get recommended to young people by iconoclastic educators, and those young people will then turn around and apply Conrad’s attitudes to new media awaiting to be subverted.